Home energy efficiency results in lower household costs – and who wouldn’t want to pay less? The thing is, energy efficiency sounds great but we often don’t pay a lot of attention to it. We take things for granted, not even questioning if something can be done to reduce the costs and increase energy efficiency. The reality check moment usually comes in the winter when you see your bills growing regardless of how much energy you are trying to save. But really, when temperatures go down you are not thinking about how much is that going to cost you – keeping warm is the priority. An additional layer of insulation and replacing household appliances seems like a costly project so you might think “I would rather pay the high bill”. But what if we told you there are few simple and cheap ways to make your home energy efficient? 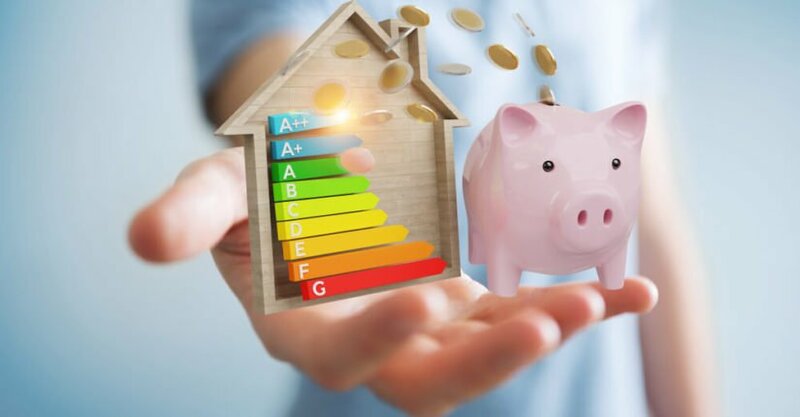 With these residential energy saving tips, you will be able to stop spending money you don’t really need to spend! This is probably the one thing you have been hearing ever since you were a child – don’t leave the light on if you don’t need it. Did You Know? The energy needed for one 100W light bulb for one hour costs you on average around $0.30. It obviously isn’t a lot. But how many 100W light bulbs do you have around your house? Let’s say you leave 10 light bulbs on for 10 hours. That’s $30! This is an easy fix that anyone can do. It might not seem like a lot of money, but hey, why give it away if you don’t need to? Is it really necessary to wash all clothes in long cycles and high temperatures? Sure, some clothing items require a good long wash. But how about items like shirts and blouses that you wore only once? The truth is, most items apart from underwear don’t even need a long time in the washing machine. They just need a bit of refreshment. Good to Know: In order to save money when doing laundry, aim to have a full load before switching the machine on. Additionally, everyday items can be washed with cold water, so change the settings on your washing machine. Pro Tip: Choose a short washing cycle of around 15 minutes and reduce the water temperature. In this way, not only you will save 90% of the energy needed to warm the water up, but you will also extend the lifespan of your clothes and keep the colors vibrant. Additional Tip: Think about tumble drying as well. Is it really necessary? If it is winter and you really don’t have where to dry your clothes – fair enough! But if it’s summer and the weather outside is lovely, why not just hand the clothes to dry? Essential Info: Tumble driers can be quite costly to run, especially if they are not very energy efficient. They can also shrink your clothes, and you don’t want that, do you? Phantom energy consumption can be a costly mistake that can add kWh to your electricity bill in vain. It is estimated that it can add 10% to your electricity bill. Chargers, TVs, appliances – are you leaving them plugged in? Even when you are not actually using the devices, if you leave them plugged in they will still be consuming energy. Did You Know? If you are leaving your charger plugged in and you are not even charging your phone, think again – you are still spending electricity! Unplug everything from the sockets that you are not using. Pro Tip: Before you leave home, just flick the main power switch (just be careful with the fridge, try and separate it from the rest of the appliances!). Why keep the blinds closed and the lights on during the day? Let a little sunshine in! Natural sunlight is not only better for you than artificial light – it’s also free! Opening the curtains or the blinds during the day will not only eliminate your need to put the lights on but it will also warm the place up. Daytime is also the best time to let fresh air in. Open the windows wide for a short period for higher ventilating efficiency. This is a very cheap and easy way to improve home energy efficiency. Doors and windows have gaps and openings where cold air might slide in while you are trying to keep the place warm. Thick curtains or drapes will not only make your home look cozier, but they will also serve as an insulator and keep the warm air in. Good to Know: In the summer when the temperatures are high, dark curtains will absorb the outside heat, keeping the temperature in your home lower. Alternatively, you can get stick-on insulation that doesn’t cost a fortune and add an extra insulation layer to your doors and windows. If you feel like the temperature in your home does not match the temperature shown on the thermostat, it is time for an inspection. When was the last time you replaced the filters or cleaned the vents? Also, are you obstructing the airflow with large items and furniture? Good to Know: Air circulation is important for reaching the desired temperature, so if you are blocking the sources of heating/cooling, you are using more energy and you are not even feeling the benefits. Outdated filters can be damaging to your heating and cooling systems, making them use more energy as a consequence. Also, you know how we sometimes tend to think that if we crank up the heating the room will get warmer quicker? Absolutely false! Pro Tip: Set the temperature where it needs to be. Higher temperatures (or lower if we are speaking about cooling systems) have nothing to do with how fast the room will heat up. If you were aiming for 70F but set the temperature to 75F thinking it will get warm quicker, chances are you will forget and leave it on 75F the entire time. Those 5 degrees can cost you an extra 10% on your bill! Ah, food! Nothing like the smell of something cooking in the oven! You just can’t wait for it to be done so you can dig in! You go to the oven, grab the handle and you are ready to open in and take a peak. Stop right there! Did You Know? A single opening of the oven can drop the temperature by a lot. And how many times do you usually open the oven when cooking? Pro Tip: There is a reason why the front of the oven is made out of glass – so you can see without opening it. Why let you oven waste additional energy to reach the temperature? Keep your hands off and let it do its job! Few minutes before your food is done, completely switch the oven off and leave the food cook in the warmth. Also, whenever possible, use the microwave instead of the oven. Additional Info: Microwaves are much more energy efficient and cook food faster. They use only 10% of the energy that the oven does. Central heating/cooling systems are great. But do you really need to keep your entire home warm or cold? You and the members of your household are probably out or at work most of the time. The heating and cooling systems should not be operating when nobody is home. During hours of relaxation, why not get the entire family in the living room and spend quality time together? In that way, you can save money by heating up only one room and engage in fun family activities. Also, the bedrooms don’t need to be very warm during winter. Good to Know: The best temperature for sleeping is between 60F and 67F. For the living room, you are probably aiming above 75F in winter. Snuggle up in a warm blanket and cut down on your heating costs! One of the best ways to make your home energy efficient is by using clean renewable energy. Installing solar panels might seem like a costly investment, but luckily there are other ways around it. Did You Know? With Arcadia Power, you can start using clean energy and not only lower the cost of your bills but also make a positive impact on the environment. Pro Tip: If your electricity usage supports renewable energy then you can automatically start saving and do your part in cutting down carbon emission. Doesn’t sound like a bad idea, does it? Do you think you are paying a bit too much on your bills? Well, you might be! Are you using the cheapest provider available? You are not sure, are you? If you don’t have an answer to the above questions, it is probably time to check. If someone is offering the same services for a lower price, why not use the opportunity? Pro Tip: Or you can get Cushion to do part of the job for you. Cushion is a handy little app that does much more than just negotiating your bills. Cushion will analyze your spendings and see if you are spending money that you shouldn’t be, as for example subscriptions that you have forgotten about. When it comes to reducing your bills, Cushion can negotiate your cable or Internet bills and save you money! Hidden fees will always be a thing. And the truth is, we are not very good at spotting them. Every transaction you are doing may be a subject to a fee. There is a chance to get that money back! Did You Know? Cushion is a very smart app that can fight to get you the fee money back on your behalf. All you need to do is connect your bank account and authorize the Fee Fighter to go after your money.You might get back money that you didn’t even know you paid out! We are all using a lot of water, especially when we are taking a long hot shower. So in this case, you are wasting both electricity and water if you don’t find a way to make the entire process more efficient. Replacing the shower head with a low flow one will save you a lot of money on your water bill, which is nice. Also, think about taking shorter showers, it is only logical to save water and money, isn’t it? Also, a quick thing you can do to save money on heating and reheating water is to wrap the boiler in an insulating “blanket”. This will help maintain the water temperature higher for longer. Does the water really need to be that hot?If you lower the temperature on your water heater, you can save a bit of money every year. Good to Know: It is estimated that for every 10F you lower the temperature, you can save $15 to $30 each year. This is a very simple residential energy tip that you might have overlooked – don’t use the dry heat setting on your dishwasher. Chose the air dry option, or simply grab a towel and dry your dishes like that. Good to Know: Doing this can save you around $30 on your electricity bill in a year. It might not seem a lot, but for such a small change is actually quite good. To improve home energy efficiency, you need to identify all spots where cold air from the outside might be coming in when you are trying to heat your home up. Good to Know: Sealing such air leaks can result in high energy savings – up to 30% off your bill! We already spoke that cranking the heating up is not good if you want to save money. Here’s a related way to make your home energy efficient. Raise the temperature slowly. If you quickly raise the temperature of your heat pump, the heat strip will be activated which consumes much more energy. If you are trying to improve your home energy efficiency, insulating the hot water pipes is a thing you should consider. By doing this, you can raise the temperature of the water that goes through the pipes for up to 4F. If you can achieve that, you can lower the water heating temperature and save money on your utility bill. Improving home energy efficiency doesn’t need to be a costly project. By doing some small changes you can cut down on your bills and do your part in protecting the environment. Do these things seem easily achievable to you? They sure are! It is about changing your mindset and focusing on your home’s energy efficiency. In the long run, these habits can save you quite a bit of money. Have you used any of these tips previously? If so, what was your experience? We would be happy to hear how much you’ve saved!